André-Marie Ampère (/ˈæmpɪər/; French: [ɑ̃pɛʁ]; 20 January 1775 – 10 June 1836) was a French physicist and mathematician who was one of the founders of the science of classical electromagnetism, which he referred to as "electrodynamics". The SI unit of measurement of electric current, the ampere, is named after him. Andre-Marie Ampère was born on 20 January 1775 to Jean-Jacques Ampère, a prosperous businessman, and Jeanne Antoinette Desutières-Sarcey Ampère, during the height of the French Enlightenment. He spent his childhood and adolescence at the family property at Poleymieux-au-Mont-d'Or near Lyon. Jean-Jacques Ampère, a successful merchant, was an admirer of the philosophy of Jean-Jacques Rousseau, whose theories of education (as outlined in his treatise Émile) were the basis of Ampère's education. Rousseau believed that young boys should avoid formal schooling and pursue instead an "education direct from nature." Ampère's father actualized this ideal by allowing his son to educate himself within the walls of his well-stocked library. French Enlightenment masterpieces such as Georges-Louis Leclerc, comte de Buffon's Histoire naturelle, générale et particulière (begun in 1749) and Denis Diderot and Jean le Rond d'Alembert's Encyclopédie (volumes added between 1751 and 1772) thus became Ampère's schoolmasters. The young Ampère, however, soon resumed his Latin lessons, which enabled him to master the works of Leonhard Euler and Daniel Bernoulli. In 1796 Ampère met Julie Carron, and in 1799 they were married. 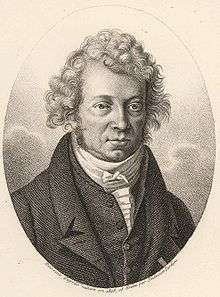 André-Marie Ampère took his first regular job in 1799 as a mathematics teacher, which gave him the financial security to marry Carron and father his first child, Jean-Jacques (named after his father), the next year. (Jean-Jacques Ampère eventually achieved his own fame as a scholar of languages). Ampère's maturation corresponded with the transition to the Napoleonic regime in France, and the young father and teacher found new opportunities for success within the technocratic structures favoured by the new French First Counsel. In 1802 Ampère was appointed a professor of physics and chemistry at the École Centrale in Bourg-en-Bresse, leaving his ailing wife and infant son in Lyon. 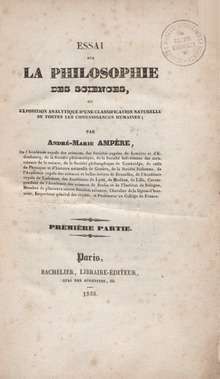 He used his time in Bourg to research mathematics, producing Considérations sur la théorie mathématique de jeu (1802; "Considerations on the Mathematical Theory of Games"), a treatise on mathematical probability that he sent to the Paris Academy of Sciences in 1803. Ampère engaged in a diverse array of scientific inquiries during the years leading up to his election to the academy—writing papers and engaging in topics from mathematics and philosophy to chemistry and astronomy. was customary among the leading scientific intellectuals of the day. Ampère claimed that "at eighteen years he found three culminating points in his life, his First Communion, the reading of Antoine Leonard Thomas's "Eulogy of Descartes", and the Taking of the Bastille. On the day of his wife's death he wrote two verses from the Psalms, and the prayer, 'O Lord, God of Mercy, unite me in Heaven with those whom you have permitted me to love on earth.' Serious doubts harassed him at times, and made him very unhappy. Then he would take refuge in the reading of the Bible and the Fathers of the Church." In recognition of his contribution to the creation of modern electrical science, an international convention signed in 1881 established the ampere as a standard unit of electrical measurement, along with the coulomb, volt, ohm, and watt, which are named, respectively, after Ampère's contemporaries Charles-Augustin de Coulomb of France, Alessandro Volta of Italy, Georg Ohm of Germany, and James Watt of Scotland. His name is one of the 72 names inscribed on the Eiffel Tower. Weisstein, Eric W. (ed.). "Ampère, André (1775-1836)". ScienceWorld.